The following section describes how to set your language on ActivityInfo. ActivityInfo offers a number of languages for users to choose from. If you prefer to work in a language other than English, you can easily switch your system language. If you work in a single language, you can choose to set your language permanently by setting the preferred language on your account. Alternatively, if you like to move back and forth between multiple languages, you can quickly switch to another language at any point. When you log back in, your language will revert to your account's preferred language. Switching your language will only change the language of the ActivityInfo system. Any data entered by users will not be affected by this change. 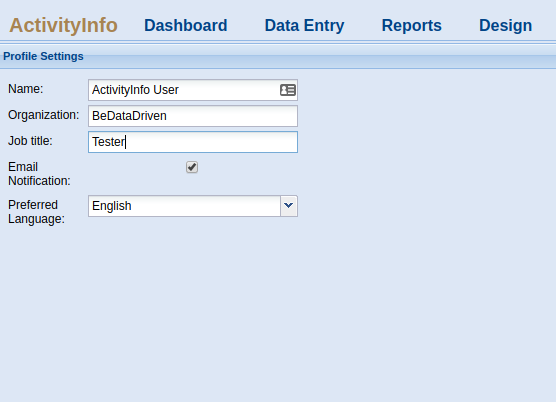 On any ActivityInfo page, click on the Language icon in the top right-hand corner. 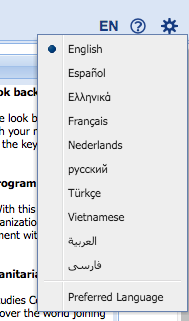 Select the "Preferred Language" option on the drop-down menu to navigate to your language settings. On your Profile Settings, select your language from the "Preferred Language" drop-down menu. Select a language option to switch to from the drop-down menu. This setting will not be remembered the next time you log in. Instead, the language will revert to your Preferred Language.